The Rosaleda or Rose Garden is a garden used to present and grow various types of garden roses. The roses are displayed grouped by individual variety, colour or class in rose beds. The flowers come from all over the world and it's a spectacular sight when they are all in bloom (spring and summer). Also there are neatly groomed pathways and thoughtfully laid out garden; and several fountains. It is located in the Parque del Oeste (West Park), which as its name suggests is located west of the city. The Rose is a gift to the senses. Enjoy the colors and smells that are rarely concentrated in one place. A peaceful haven near the Plaza de Espana Square! Every year during the month of May is celebrated as the International Rose Villa New Madrid. A contest to select the most beautiful rose. Gardening enthusiasts will rush to ask to put their best flowers. This place is, definitely, a must-visit for vacationers and travelers who want to discover beautiful places (especially in spring and summer). 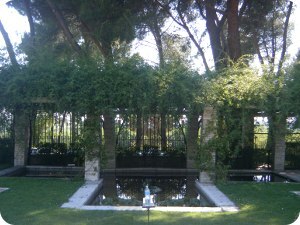 Make sure to come to the Rosaleda Gardens during your getaway in Madrid. Winter: 10:00 to 19:00 h.
Summer: 10:00 to 21:00 h. Depending on the sunlight! * Line R - Opera/Príncipe Pío: Príncipe Pío station.